We had a disaster at work on Sunday. When I came water was pouring (excuse me, spurting) out of a fan in the ceiling! The fan was in the bathroom, and it looked like something had exploded in there. Water went all over the floor of the back of the shop as well, though most of the yarn is up high enough of the floor on the bottom shelves to keep them from getting damaged. Our poor owner had to come in from vacation, along with all THREE landlords/owners of the building. The pipe was repaired eventually, but not after the people who live above our shop put water down the drain (after being told to NOT run the water, twice! ), dousing one of the plumbers pretty thoroughly, never mind spraying another sink full of water all over. Again. 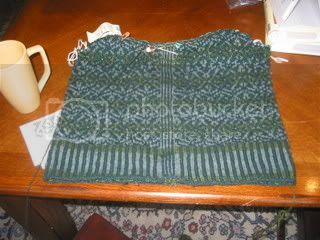 All the excitement of having water going everywhere and plumbers taking out chunks of ceiling meant I didn't get as much work done on the vest I am working on as a shop sample, but I am now up to just past the armhole opennings. The pattern is from Sweaters from Camp. 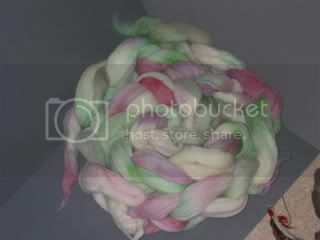 I've been doing quite a bit of dyeing of pastel colors this last week, and spinning lots of muted colors. Pretty much the opposite of the colorful mood I have been in! This particular one is 100% wool. No surprise there, huh? A did get quite a few (6? 8?) 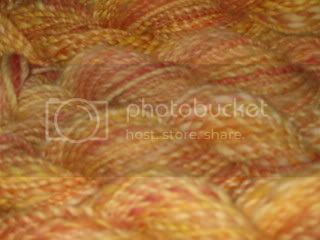 skeins of a 2 ply gold toned yarn with rusty and pink tones spun up. Spinning has been difficult lately because the cat demands to sit right in the center of my lap. He does the same thing with computers, insisting on sitting across BOTH of you arms and half of the laptop's keyboard as well, just for good measure. I am already so burned out with this quarter. It won't be hard, just very very time intensive, and added to it making sure to have everything set up so I can graduate. There is a light at the end of the tunnel though! I got in to the paralegal program here for the fall!